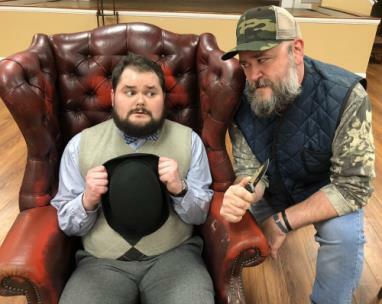 The Ringgold Playhouse will open its 2019 Season Thursday with the classic comedy The Foreigner. Actors Will Park, left, and Chuck Nalley work a scene together during a recent rehearsal. The Ringgold Playhouse will kick off its 2019 Season on Valentine’s Day with the comedy The Foreigner. TRP officials say the company is excited about the great theatre they have lined up this year. Director Greg Rambin, Sr. said he’s had a great time crafting his vision for the play, which just happens to be one of his all-time favorites. The setting is a fishing lodge in rural Georgia often visited by "Froggy" LeSueur, a British demolitions expert who occasionally runs training sessions at a nearby army base. This time, Froggy brings along a friend; a pathologically shy young man named Charlie who is overcome with fear at the thought of making conversation with strangers. So Froggy, before departing, tells all assembled that Charlie is from an exotic foreign country and speaks no English. Once alone, the fun really begins as Charlie overhears more than he should—the evil plans of a sinister, two-faced minister and his redneck associate; the fact that the minister's pretty fiancée is pregnant; and many other damaging revelations made with the thought that Charlie doesn't understand a word being said. That he does fuels the nonstop hilarity of the play and sets up the wildly funny climax in which things go uproariously awry. Now in its sixth season, TRP continues to treat audiences to new faces from the area’s talent pool. “We have a lot of great actors in our company, but every year we get fantastic new faces that want to come to Ringgold and tell great stories on stage,” said Mr. Cook. The cast features three TRP alumni; Dana Rogers as “Ellard,” Chuck Nalley as “Owen,” and Dan Lyons as “Froggy,” as well as four actors making their TRP debuts; Denise Frye as “Betty,” Joanna Keeling as “Catherine,” Andrew Boone as “Rev. 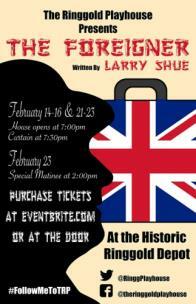 David,” and Will Park in the title role of “Charlie” the foreigner. The production will include seven performances over two weekends; Feb. 14, 15, 16, 21, 22, and 23 at 7:30 p.m., as well as a special matinee performance Saturday, Feb. 23 at 2 p.m.
Tickets are $10 general admission and $8 for seniors and student. They can be purchased on the city’s website; CityOfRinggoldGa.gov, or at the door.